Yesterday at the grocery store I noticed bunches of roses (with baby's breath), bouquets for February 14th. I loved the shapes and colors, so I took a couple of quick pictures with my trusty phonecam. Last night I cropped one of the photos to get this composition, and then opened it in Painter IX, thinking I would posterize it. But instead, I decided to try making a digital woodcut from the image. I adjusted the settings to get the amount of black line that I wanted. 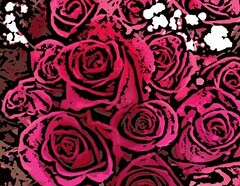 I wouldn't normally think of roses for a woodcut, but it does emphasize the shapes of the petals. I decided this would be a good image to post today. There is no such thing as too many roses, and no such thing as too much love in the world. Hey Randi - this is stunning!